Posted by rogerhollander in Russia, Trump, Uncategorized. Roger’s note: Confession, I didn’t vote for Clinton, and during the election I took the position that there was no difference between the two stooges of the oligarchy. However, the minute that Trump won, something I didn’t think could ever happen, I started to re-think. The major concern being the nuclear codes in the hands of a madman. On sober third thought, however, I more or less agree with this article. Of course, there is a difference to some degree between the two parties, especially in the area of immigration; but on the essential issues of war and peace, labor and capital, the parties are essentially the same. Of course, too, there is also the argument that Democrats in power co-opt much of the opposition because of the myth that the Democratic Party is somehow progressive. Robert Mueller, the former head of the national political police (FBI), has indicted 13 Russian nationals for the crime of sowing “discord in the U.S. political system” and encouraging “U.S. minority groups not to vote in the 2016 U.S. presidential election or to vote for a third-party U.S. presidential candidate.” The defendants’ nationality makes their acts of political speech a crime, in Mueller’s legal view, but “at least 20 Americans” are embedded in the document as unindicted co-conspirators “ because they interacted in various ways with the Russian team’s activities during the 2016 presidential campaign. The Russians will never face trial in the U.S., and it is highly unlikely that the unindicted Americans will be criminally charged — but that is not the purpose of Mueller’s indictment. The political crime has been defined, for the broad purpose of repressing dissent in the United States. The witch hunt has found a legalistic vocabulary. These are the Russians’ words, but the sentiment is not at all alien to the contemporary and historical Black political conversation. Yet, for Blow, it is heresy and devilment to urge Black people to vote for third parties, or to refrain from voting. There ought’a be a law against it! — or some string of words that can be made to sound like a law. “What happened in this election wasn’t just a political crime, it was specifically a racialized crime, and the black vote was a central target,” wrote Blow. Blacks that refuse to forgive the Clintons for mass incarcerating and dehumanizing our people are guilty of Black voter suppression and deemed dupes of both Trump and the Kremlin. To prove that anti-Clinton Blacks are in league with foreign and domestic devils, Blow quotes a Trump operative who bragged that the Republican campaign reminded Black voters about Hillary Clinton’s “suggestion that some African-American males are ‘super predators,’” in order to discourage them from voting. Mueller’s legal framework requires that we forgive such trivial history as mass Black incarceration. The Democratic Party reluctantly added its name to the recount petition, while at the same time claiming it had seen no “actionable evidence ” of grounds for challenging Trump’s victory. But that’s par for the course. The Democrats have never confronted the GOP’s blatant theft of elections through massive suppression of Black votes. They are bound, apparently, by a gentleman’s agreement among the two parties. John Lewis, the Black congressman from Atlanta who wears his voting rights credentials like a robe of glory, abides by that agreement. The first thing out of Lewis’ mouth after Trump was declared the winner, in November, was a denunciation of “the Russians” – but not Black voter suppression by Republicans. Roughly one year later, Jill Stein — who fought Black voter suppression harder than the Democrats — was targeted for investigation by the Senate Intelligence Committee as a possible collaborator with the Russians . The suppression of the franchise of their Black base is not considered “treason” or any kind of “high crime” by the Democratic Party, but the siphoning of Black votes away from the corporate duopoly, through voluntary non-voting or support of third parties, is cause to bring out the pitchforks. Under the Mueller legal formula, there are many more potential co-conspirators. The highest political crimes are “sowing discord” and “spreading distrust towards the candidates and the political system in general” – for which one can theoretically go to prison, if you are a foreigner (Russian, not Israeli), or become an unindicted party to the charge, if American. The Republicans, of course, have been sowing racial discord as a matter of policy ever since they adopted their “Southern Strategy” in 1968, and it’s been key to their success ever since. The United States is the nation that invented apartheid, and has served as a model for racists around the world. Racial discord is part of its DNA, and is the principal reason for the historical lack of a social contract and the weakness of the Left in this country. Corporate political hegemony would not exist in the U.S., were it not for the endemic nature of white supremacy in this society. The Russians have nothing to do with it — especially the Russian amateurs from St. Petersburg. The cabal has flipped the factual script. It was the Democrats and their allies in corporate media and the national security state that devised a calculated campaign to sow “discord” and “distrust towards the political system in general,” such as not seen in living memory. The initial goal was to depose or discipline the unpredictable, racist billionaire who in 2016 crushed the establishment leaders of the Republican Party — potentially destabilizing the duopoly system of corporate governance — rhetorically rejected the dogma of “free trade,” and spoke as if he would not maintain the momentum of his predecessor’s global military offensive. With the “intelligence community” on point, the political offensive could not help but take on the characteristics of a profoundly destabilizing regime change and psychological operations mission. In other words, the ruling circles of the imperial superpower set out to destabilize and call into disrepute the sitting government of the home country. They have inflicted great trauma and anxiety among the public in the process, but thanks to the corporate media component of the cabal, most of the blame has accrued to the targets of the campaign: Trump, “the Russians” and those defamed as “dupes” and “co-conspirators” with the fictitious Putin-Trump axis. It is quite evident that this campaign of self-inflicted chaos is a project of the global corporate class, manifesting elsewhere in the “West” in remarkably similar fashion, but with local characteristics. Russia is, thus, charged with attempting to subvert governments around the world through minions like the St. Petersburg outfit. Through their servants in the Democratic Party, the corporate media, and the intelligence agencies, multinational capital has used Trump’s election to inflict a kind of shock treatment on their domestic polities — a very dangerous gambit, especially in the United States, with its weak social contract and immense capacity for civil violence. More dangerous, is the whipping up of war fever based on Russia’s non-existent aggressions (Ukraine, Syria) and fabricated ambitions (the demise of the “West”). We can be confident in blaming this politically engineered horror on the dominate elements of the U.S. capitalist ruling class, since they could surely call the project to a halt if it were merely a “rogue” enterprise mounted by a small section of their class-mates. Capital is using Russiagate to inflict extreme shocks to the very political system they claim to be defending. The trauma is necessary, they believe, because capital has nothing to offer to the masses of people, and must therefore dramatically weaken or destroy the political mechanisms through which the people make demands on the rulers. They are preparing the landscape for a regime of permanent austerity and war, and plan to suppress all opposition on the Left. That’s why Black Agenda Report and a dozen other Left web sites were named and defamed as Russian fellow travelers and purveyors of “fake news” by the Washington Post, the plaything of the CIA-partnered oligarch, Jeff Bezos. A lot has happened in the space of a little over a year. 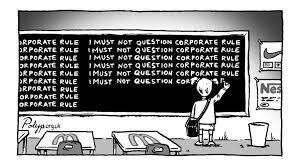 Based on Russiagate-era interpretations of “law” and civil propriety, free speech is in the political eye of the corporate owners of media. The shrinking of the digital world that is accessible to the Left is well underway, with no workable alternatives in sight. The Russiagate express keeps on rolling, despite the fact there is still no evidence for the original contention, that “the Russians” and Vladimir Putin conspired to steal and reveal the emails of the Democratic National Committee, Hillary Clinton and John Podesta. Rod Rosenstein, the Deputy Attorney General, emphasized that there is no evidence that any actual votes were altered or tampered with in the 2016 presidential election. No matter. The Democrats keep imagining other “Pearl Harbors” worthy of going to war over, because their project is to harden the political system for endless war and austerity. BAR executive editor Glen Ford can be contacted at Glen.Ford@BlackAgendaReport.com .